New year new telecom/media provider? Non-UK readers can stop here… Tech-savvy UK readers I could use some advice. Price-wise TalkTalk is a no-brainer – half the price of the other options (£200 a year for 20Gb a month broadband plus almost unlimited calls except for national daytime) – but its customer service has a lousy reputation. Does anyone here use them? Are they any better than they were? How can they afford to be so much cheaper than anyone else? Do they make it up on volume? Are there any other ISPs you could recommend that offer good service and un-capped or high-cap broadband for a low price (with or without an inexpensive telephony option)? If we go freesat should we go ahead and get the Humax PVR or are there other good freesat PVRs on the near horizon? Romcoms are bad for your emotional development? Remember I couldn’t get Google Talk to run on my non-Intel Mac? I can’t get the new Mac beta of BBC’s iPlayer to run either (well it runs but it isn’t recommended for non-Intel macs according to the BBC and the frame rate is lousy on my G4). BBC iPlayer now available on Mac – great! (What they mean is that you can download iPlayer programmes on these new platforms – before you could only watch streamed video). I just heard about the nabaztag (Armenian for rabbit – hello Leslie!) via Jeremy Hunsinger and though I am not quite sure what it does I am sure I would like to get a “digital pet” like this one one of these days. OK it’s a lot of money for what would probably end up being a glorified alarm clock but smart appliances intrigue me. 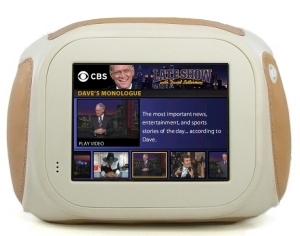 The Chumby (below) is more capable and flexible but also somewhat more expensive (and less cute). It’s not distributed here either, it seems. The biggest problem networks have with serialized shows is that they’re closed shops: if you didn’t start watching at the beginning of the season, it’s difficult to understand what’s going on. I would add that if at any point I stop watching (or you have to stop because a series ends) I find it harder to re-establish my enthusiasm when I start again. The only way I’ve managed to get around this problem is by consuming shows some time after they’ve started so I can watch them back to back without big pauses in between.